Thank you to everyone who donated to APWA-MN Toys for Tots campaign at the Fall Conference! We are happy to report that collectively we raised $4,429 for Toys for Tots. 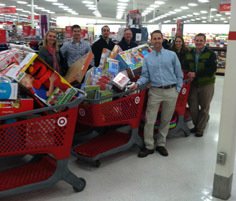 On December 12, a group of us had the honor of taking this cash to Target to shop for toys. Target gave us a 5 percent discount so we were able to purchase even more toys than we anticipated. Seven of us loaded up 10 carts while doing our best to keep track of our running total and moved our train through Target to the check out. We were happy with how close we made it to our total. On December 15, APWA-MN members appeared on Kare11 as we made our donation. Marcus Thomas served as our spokesperson. If you haven't seen the clip yet, view it here. We are already looking forward to next year as we hope to collect even more Toys for Tots! !